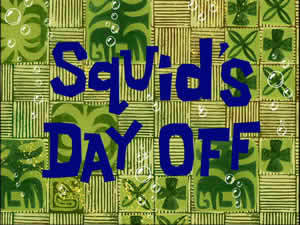 Squid's Day Off (Episode) – From SpongePedia, the biggest SpongeBob-wiki in the world! Squid's Day Off is an episode from Season 2. On a customer less Sunday at the Krusty Krab, an accident lands Mr. Krabs in the hospital, and with Squidward left in charge of the Krusty Krab for a day. Using this authority to his advantage, he takes the day off under the pretense that he must run errands, leaving SpongeBob to manage the Krusty Krab on his own. Squidward's attempts to relax at home are thwarted by increasing paranoia; various fantasies of SpongeBob ruining the Krusty Krabs’ business (such as giving away all of its profits or setting fire to the building) run through his mind, forcing him to return to the restaurant multiple times in order to monitor SpongeBob's actions. However, each time he gets there, he finds everything to be normal. Squidward's anxiety eventually causes him to go insane. He becomes obsessed with finding SpongeBob slacking or doing something wrong. While taking a bath, he sees SpongeBob swimming down the drain of his bathtub. Thinking that he is going back to the Krusty Krab, a naked Squidward attempts to get there first. Upon arriving at the Krusty Krab, Squidward realizes that his encounter with SpongeBob in his bathtub was a hallucination--SpongeBob had never left the restaurant's cash register. After lending Squidward his own pants, SpongeBob finds that the "CLOSED" sign on the Krusty Krabs' door had never been switched to "OPEN", remarking that he and Squidward "could have taken the whole day off." causing Squidward’s head to deflate. Squidward has eight tentacles when he dives underwater, but he actually has six tentacles. In other episodes, the Krusty Krab closes on Sundays. The doorknob on the door of Squidward's house constantly changes position from left to right. Squidward does not regularly wear any pants he only wears a brown shirt. When Squidward was at the Krusty Krab, while SpongeBob was singing "I'm sure you are! ", Squidward's neck was colored the same as his shirt. At the end of the episode, when Squidward starts to lose air, at one part of that process, he looks like E.T.